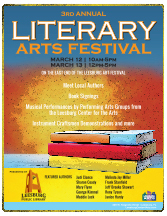 The Leesburg Public Library is hosting its 3rd Literary Arts Festival in partnership with the 39th Annual Leesburg Art Festival. Guest authors (including me!) will be in front of the library for conversation, book sales and autographs. If you're in the Leesburg, FL area on March 12-13, and you're looking for a fun festival, come on over and say hello. I'll be there all weekend with some fellow local authors, signing books and talking with writers, readers, and book lovers. Saturday, March 12 from 10:00 a.m. - 5:00 p.m.
Sunday, March 13 from 12:00 noon - 5:00 p.m.